Walk into the Haut Surf Shop on Santa Cruz's West Side, and you notice it right away. Absent are the typical shiny displays of overpriced sunglasses and shelves bulging with trendy surfwear. Instead, the glass display case houses cakes of wax, resin and other fix-it yourself sundries; there's a couple of modest racks of sweatshirts and T-shirts bearing the Haut logo, and a decent selection of wetsuits and other neoprene necessities. Time-faded surf photos line the walls. And at the back of the shop, the light bounces off a couple of dozen beautifully colored and polished surfboards, stacked in precise descending height from longboards to shortboards, like the Von Trapp Family Singers at attention. And it hits you. This isn't a surf shop. This is a shop for surfers. On any given day you'll find its 56-year-old proprietor, Doug Haut- pioneering North Shore surfer, master shaper-at home in his little fiefdom on Swift Street, where it's been for 26 years. That is, if he's not surfing. Or fly-fishing. Or sailing, windsurfing or duck hunting. "He's an unsung hero in my life," says Richard Novak, Haut's onetime business partner and longtime friend. "A friend of ours died of leukemia in 1979. I asked him before he died, whose life he admired most? And he said Doug's. Because Doug would get up in the morning and check the surf. And if the surf wasn't happening, he'd check the fishing. And if that wasn't happening, he'd check the sailing. And if that wasn't happening, he'd go to work. "He's maintained the quality of life we all sought." It's a life that has taken him far from his native Wisconsin, which he left at age 14 for the Bay Area. By the time he graduated from Los Altos High, he was already driving frequently to Santa Cruz to surf, and soon moved there. "Doug was here when it wasn't easy to live in Santa Cruz," says Glen DeWitt, owner of Rainbo Fins and another longtime friend. "It was hard to make a living here. But we were so lucky to have grown up in a period when Santa Cruz was wide open. You could sleep on the beach and surf wherever you wanted with no crowds." A couple of years later he made his first trip to Hawaii's North Shore, where he eventually came under the tutelage of famed surfer and shaper Mike Diffenderfer (1937 - 2002). "I always wanted to shape," says Haut, who like many of his shaping brethren, displays a characteristic lack of garrulity. "I just started at the bottom and worked my way up." 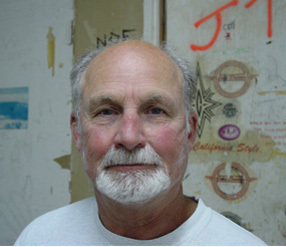 By the mid 60's he was back in Santa Cruz, shaping boards for Novak and another friend, George Olson. By that time, Haut had already made a name for himself in Hawaii, mastering the big waves that only a few had surfed. It wasn't until the late 50's that a small cadre of surfers started venturing into the waves of Oahu's North Shore, surfers whose names endure today: Buzzy Trent, the Hoffman brothers and Greg Noll, to name a few. "We were the next wave through" says Novak. "When we started surfing there, it was "Here's the wave, this is what we want to do, not "Here's the wave, let's see if we can survive." Yet Haut never received the kind of publicity afforded others of that era, specifically the guys whose exploits were chronicled, recorded and celebrated as the Southern California surfing lifestyle. "One of the reasons Doug never got the recognition he deserved" says Novak, "is because he was from Northern California. In Santa Cruz, you'd never go in the water if someone had a camera, because you didn't want it to get out what greats waves we had here." "He's a legend in surfing," says Glen DeWitt. "He known from Florida to Oregon and Washington to Hawaii. He didn't get the press like the Van Dykes and Noll, but that didn't bother him. It's still cool to me to think, "I'm sitting here with Doug Haut. Many people, when they move into stardom, they're not like Doug. He's like a beautiful woman who doesn't know she's pretty." His most popular design right now, Haut says, is the hybrid-'fun' boards in the 7-foot 2 inch to 7-foot 10 inch range. 'I can't shape enough of them to keep up with the demand,' says Haut. He turns out three or four boards a day, each taking an hour and a half or two hours to shape, and sells them at shops in Washington, Oregon, California, and Florida. 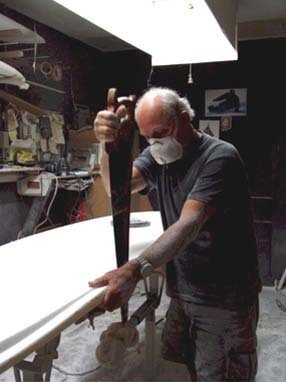 In honor of his 30th year of shaping-including his 20,000th board-Haut is making 25 to 30 anniversary boards, collectors's items featuring a wooden T-band stringer and tailblock. Each takes nine to 10 hours of shaping time and is priced around $ 950. And for those who can afford the $ 2,400 price tag. Haut is shaping three or four boards entirely of balsa. Decades ago the material of choice for boards long before pre-shaped blanks rendered such artistry unnecessary. 'I never wanted to be the No. 1 shaper in the world,' says Haut, 'but I wouldn't mind being No. 2 or No. 3.' Says Novak 'My feeling is he's the best shaper in the world right now, and no one really knows it. And the jerk's too modest to admit it.